R.M.’s morning began in the customary way. The dog kissed him awake. He felt his way through the dawning light towards the coffeemaker and pressed the start button, pleased that he’d remembered to set it up last night. He shuffled to the front door to retrieve the Sunday newspaper, the Milwaukee Enquirer, and cautiously bent down, waiting for his lower back to remind him that he’d shoveled and snow-blown most of the previous afternoon. So far, so good. His day was beginning well. But it was still early. “Morning.” He briefly hailed a clockwork runner – their customary courtesies curtailed by the cold – jogging in the less icy middle of the road, off-stride with clumsy dog in tow. Its passing bark snapped sharply on the freezing air. From its landing site in the crusted snowbank R.M. dislodged the paper, extracting it from its protective sleeve. He glanced at the headlines, and wondered the usual two things: one, why he still subscribed to this rag, and two, how news about the real estate market would be twisted in this week’s edition. R. M., a full-time Realtor – capitalized, and with the little ® symbol for professionally licensed, not for registered trademark, after the word – welcomed Sundays, big days for real estate. It was still too dark inside his northern exposure foyer to read the small print so he peered his way back to the eastern prospect of his kitchen. 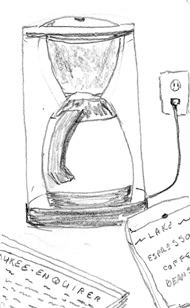 The old, unreliable coffeemaker hadn’t overflowed and he poured out that first, always gratifying cup. There was no sports story on the front page to grieve his journalistic standards but there were few open house ads to check for accuracy, either. For the most part, ads were online. Online, like everything else it seemed. Except for coffee – that you still had to drink to get – no good simply searching for that. Mrs. R.M. made a groggy appearance. Blearing through her vaporous coffee, she took up the weather page, glared at R.M. for no particular reason, and frumped away, swathed in impenetrable folds of faded housecoat. He revisited their plan to make his special quiche for breakfast. Brunch now, he recalculated. Over a second cup, he perused those ads that did remain in the much abbreviated real estate news. It didn’t take long as it used to in the days when there was a whole section just for that. Now, real estate companies kept their advertising in-house, and on their own websites, each hoping to capture a larger market share. Not that this necessarily made things easier for visitors. R.M. worked the condo market, had been in real estate since the early 90’s and the first conversions of older buildings to condominiums in the downtown area. Granted, twenty years ago, print ads for condos had made little sense, with page after page of listings for sale. Everybody knew there would be granite counter tops, but where on earth was the place, and oh by the way, any chance of a listed price? The market had grown up fast though he still saw those years in his mind’s eye. Hopeful buyers huddled over their Sunday papers, highlighting the places they thought worth a look. In their cars too, trolling through neighborhoods, pointing and waving their fistfuls of data sheets. Back in the glory days of real estate the more avid – just to get a head start – went out on Saturday night to collect an early edition. 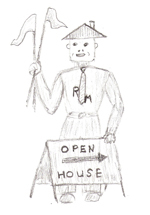 And larger real estate companies had given out maps, highlighting their open houses. Only their own listings of course. R.M. made his own map, locating all of the condo developments, in all of the neighborhoods. Location, location, location. The way we live now, R.M. reflected, it’s all about ‘the phone’ though when we use a smart phone, it’s mostly not to talk. We look up, we play, we text, we photograph, we send, we map, we pocket – but talk? He wished that more people would just talk to him, get straight to it, and save themselves a lot of time. Turning with a sigh, grown deeper in the past years, to the dwindling real estate news, R.M. grumbled as he read the proffered advice. Where were the practical explanations, guidelines for people to use to figure out if they could venture back out of the rabbit hole and into the housing market light of day? It had been a long winter already. Groundhog Day had come and gone, that first hint of spring in the air last week. But no, yet another in the slowly moving train of articles in a series that might have been called, ‘Really Important Things Every Homebuyer Should Know’ – a gospel according to the Enquirer editors. Articles about making room for a small horse, for example, or a guide to the meaning of freshly baked cookies at open houses. Really vital news. Lots of words about the ongoing, undeniable crisis. Opinion on one page about an over-supply of housing and on another, an under-supply. His point was that the majority of buyers were only going to buy one unit and live in it. Not a word about it being possible today to purchase desirable property at a good price at a low interest rate. The Milwaukee market had slowed but the paper printed articles from news services implying that things were as bad here as in other parts of the country. He believed this was a dis-service to local readers because his daily experience was quite different. Just last week a low-ball offer, made by a buyer hopeful of stealing a foreclosure, had come back rejected, supplanted by a better offer. His phone rang. He took the call.